Welcome to Big Friendly Dog Training OKC! Professional In-home Oklahoma City Dog Training Programs for ALL dogs no matter what the behavior challenge! Big Friendly Dog Training OKC is designed to help your behaviorally troubled dog, and to address your specific needs and goals. Following a reward-based training philosophy, your dog will be set up for success at the get-go, and our Oklahoma City dog trainer will work with you and your dog until we achieve success together! Why Big Friendly Dog Training? Does your dog rule over the home, causing mayhem and stress for you and your household? We can help you regain the leadership role and give your dog a structure that he/she will thrive in! Have other trainers told you your dog is beyond help, and is better off in a shelter or in line for euthanasia? Don’t give up without contacting us first, for we take pride in our success, even with severe behaviors like anxiety or any form of aggression! Do you just want your puppy or dog to learn the basics and get started on the right foot? We can help with ALL of these! 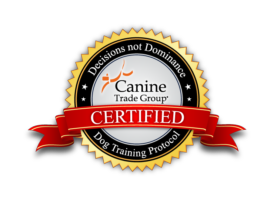 Our Oklahoma City dog trainer, Ani Jamerson is certified through Canine Trade Group, a selective school and network that works closely with clients, rescues, and the general veterinary community. Founder John Van Olden has successfully trained thousands of dogs for three decades, and is now teaching trainers the methods that have brought dogs behavioral balance and the most positive results! What makes our dog training so unique is that it is customized to the dog and the owner. We believe every dog is different, and there are individual issues and needs for each dog and their family. The training regimen we map out will be created based on what the problems are and what it is that the owner is trying to accomplish through dog training. This is why before any training commences, our trainer will meet with you and your dog initially for an in-home behavioral consultation. This allows the trainer to meet the dog, and gives the trainer and owner the opportunity to ask questions and formulate the best training strategy together. Our Oklahoma City dog training programs can help bring you the change that you and your dog deserve! Our training is both reward-based AND commitment-based, which means we stay by you and your dog’s side until we’re finished with the job! We are dedicated to helping you and your dog, and ensuring that your dog has a forever home with you and remains a happy, well-behaved family member! If you’re needing some professional guidance for your canine companion, contact us immediately! You can call our offices at 405.493.6490, or e-mail us using our contact form! We look forward to talking with you and bringing you and your dog some peace of mind! Is your dog behaviorally healthy? Take our quiz to find out!